Tales From the Trail: The Junior are Training Too! The story goes that a group of five to seven kids started the Junior Iditarod because they were less then eighteen years old and therefore couldn’t compete in the main race. The first race was held in 1978 and there were actually two divisions that year; a junior division for ages 11-14 and a senior division for ages 15-18. Ever since that first race, there has been only one division for ages 14-17. The first year the juniors ran a total of 36 miles while the seniors ran forty miles. My students were especially interested to hear that the person with the most wins – three consecutive – is Tim Osmar! They refer to him as Monica’s Tim (we have been following her training all year). And that the red lantern that first year was won by a young woman named Barbara Ryan, whose married name is now Barbara Redington (daughter in law of the founder of the Iditarod Joe Redington, Sr.)! Their jaws just about dropped. We wanted to get a little background information about the Junior Iditarod, so we used the Junior Iditarod official rules [2013 Rules] to compare the race to what we already know about the Iditarod. In partners, they read the Junior Iditarod rules carefully and hightlighted everything they thought made the Junior race different than the main race. We discussed their findings and summarized them on a chart. They knew most of the answers to the questions about the Iditarod, but it was a good chance to clear up a few questions they still had. I also had to fill in some of the missing blanks from other sources. There were a few things that were still unclear about after reading the rules, so we consulted with two people in the know, Barbara Redington, who ran the first race, and Lacey Hart, who has completed the race and will be serving as Race Marshall this year. From Redington and Hart we discovered that there really are two checkpoints in the race. The kids will leave the starting line and in about fifty-five miles will reach Eagle Song Lodge. This is a checkpoint where you can stop and drop dogs or speak to a veterinarian or race judge, if needed. 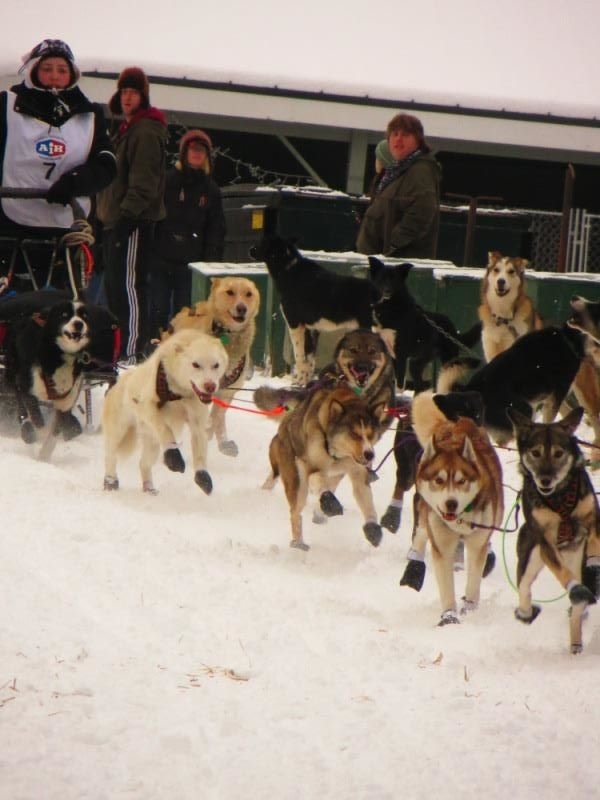 Most of the mushers won’t stop there for an extended period of time. From there it’s about 20 miles to Yentna Station Roadhouse and the extended, mandatory rest stop. They will also pass through Eagle Song again on the return trip. Nicole at the Start of Her First Race! We got the chance to interview Nicole Forto, the very first musher to sign up for the Junior Iditarod this year! I tried to encourage the boys to find a new way to interview her… but our standard movie interview won out! She sent us a great reply you can read below the video. 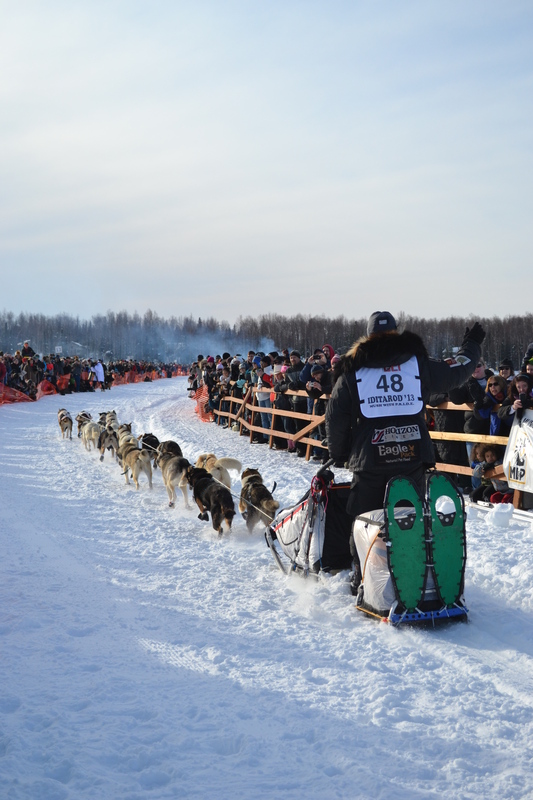 We will be bringing you lots more news from the Junior Iditarod! We have an interview set up with Lacey Hart to learn all about the job of a Race Marshall, and we’ll be checking in with Nicole monthly to see how things are going with her training! Stay tuned!